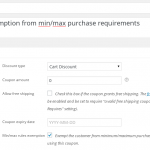 This plugin gives WooCommerce the ability to apply rules for minimum and maximum purchases to customers. Scroll down to see screenshots. 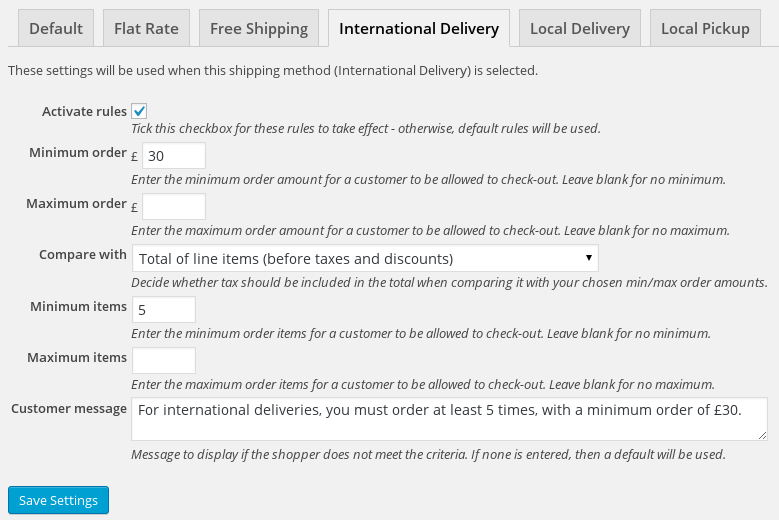 Supports WooCommerce shipping zones: You can have different rules for each shipping zone (i.e. 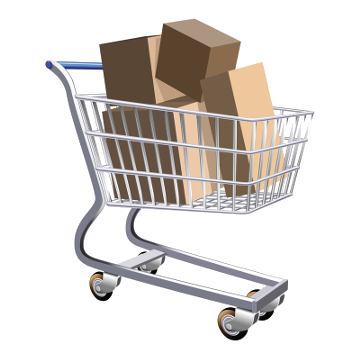 if you use the same shipping method in multiple zones, you can have different rules for each instance). 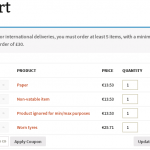 Let the customer know what they need to do: cart and check-out pages will show a customisable message when the customer's cart/order does not meet the requirements. 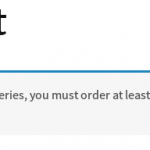 Customers who do not meet the requirements will not be able to complete check-out. Optionally, if a customer's cart is entirely made up of excluded goods (e.g. all downloadable purchases), then they can be allowed to proceed with checking out. From a recognised, long-term WooCommerce developer: We have been developing on WordPress for over 10 years. 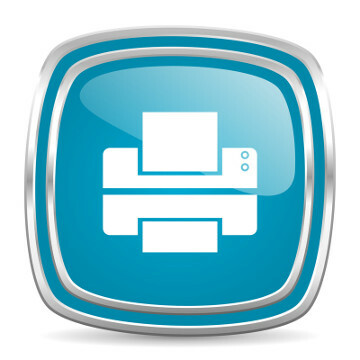 Our WordPress plugins have had a combined total of over 15 million downloads. 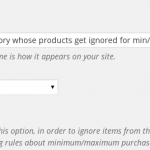 Supported with WooCommerce 3.0 up to 3.6, including the current release. 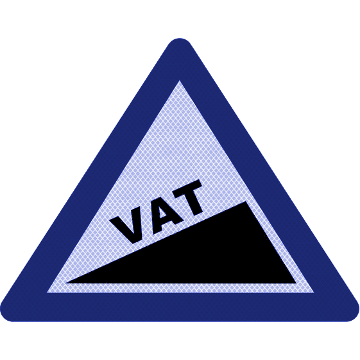 Native translations of the back-end are possible – we have a website where you can easily add further translations. (For the front-end, all messages that a customer may see are already directly customisable in the plugin configuration). 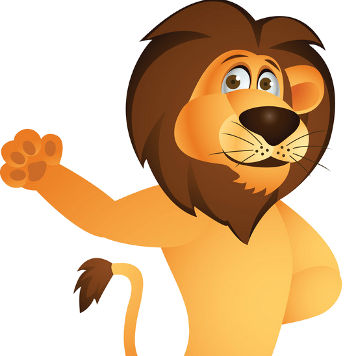 This extension comes with 12 months of access to updated versions, and support. Installation information: install this plugin in the usual way, by going to the Plugins -> Add New -> Upload screen of your WordPress dashboard. 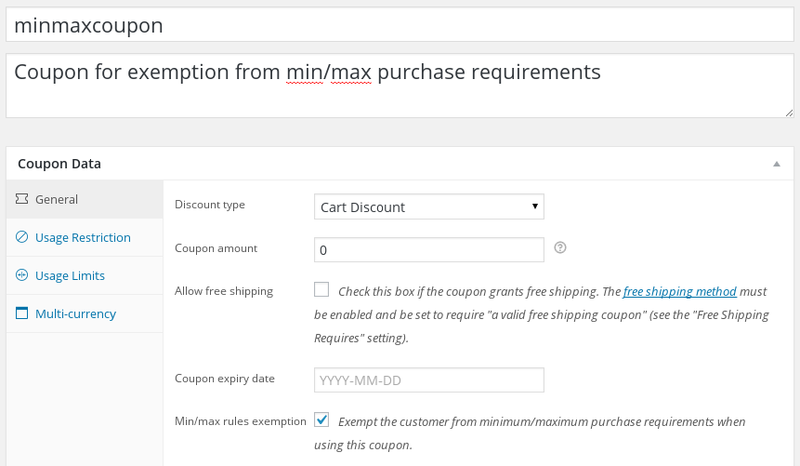 Configuration is then found in WooCommerce -> Min/Max Rules. N.B. 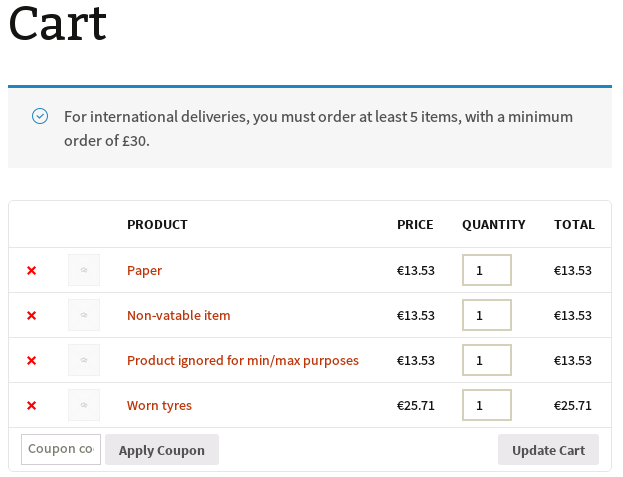 The screenshot below shows only one tab for each shipping method. 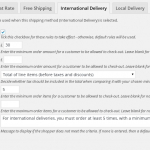 With WooCommerce’s “shipping zones”, it will show multiple – one for each zone; i.e. you can set up different rules for different zones.